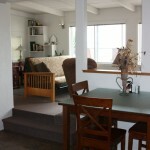 This unit is directly above the Studio and has a panoramic view of the ocean and gardens. 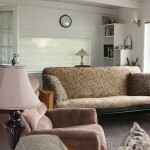 The living room has a full size futon, recliner, medium size couch, WiFi, cable TV and DVD player. 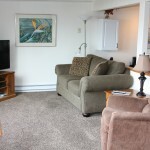 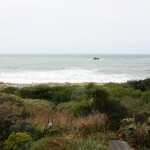 This room has two large windows facing the ocean and overlooks a large private deck. 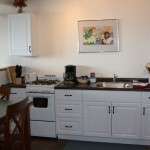 A large fully equipped kitchen is just off the living room and includes a full size refrigerator, gas range and oven, microwave and coffee maker. 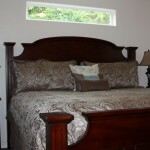 Behind the kitchen is a private bedroom with a king size bed that adjoins the full bath.